Patients with anorexia and other disorders can present many challenges. To help other treatment providers, several experts share pearls of wisdom gleaned from their own experiences. Not all RDs have regular contact with clients suffering from the likes of bulimia, binge eating disorder, or anorexia, but those who do know well the myriad challenges these clients can present. 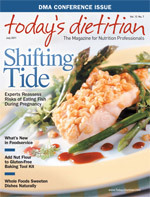 For the purpose of helping dietitians who are new to or less experienced with this demanding subset of clientele, a handful of RDs who specialize in eating disorders have agreed to share memorable case studies through which they’ve garnered what they believe to be particularly constructive pieces of counseling advice. As these dietitians can attest, sometimes experience itself is the best teacher. Lesson learned: Family members can provide valuable support during the recovery process. Case study: I have had training in family-based therapy (FBT) from the training institute run by Drs. Lock and Le Grange [Stanford University’s James Lock, MD, PhD, director of the Eating Disorder Program for Children and Adolescents, and the University of Chicago’s Daniel Le Grange, PhD, director of the Eating Disorders Clinic], who have tested this therapy in several randomized controlled trials and found this method offers excellent results in the treatment of adolescent anorexia and bulimia nervosa. Originally, my clients were the parents of a 19-year-old woman who was away at college. Their daughter was diagnosed with an eating disorder not otherwise specified (EDNOS) in her senior year of high school, but because of the EDNOS diagnosis (due to not weighing below 85% of that expected), she was not treated other than being told by her doctor to “eat more.” The family became busy with the details of college preparation and soon the daughter was away at school. After her freshman year, she weighed about 80% of expected weight, according to her lifetime growth charts, she no longer menstruated, and she had started to become rather isolated, a clear difference from her usual social self. She came home for the summer to work. Her parents were very concerned and took her to the doctor, who said she needed to eat more but did not offer a method to accomplish this. The doctor sent the daughter to a therapist, who started individual counseling. After another 6-lb weight loss in the first month of therapy, the therapist contacted me, asking for ideas about what to do. I explained the idea of FBT to the therapist, and he was interested in trying this approach. We decided this therapist would remain the individual therapist for the daughter, and I would work mainly with the parents, explaining the nature of eating disorders, research that showed what treatment(s) could work best, and the basics of home refeeding. The daughter would have the option of meeting with me to discuss those all-too-common food myths and “magical ideas about food” as they came up and when her therapist thought it would be a good idea. Before starting FBT, we did have the medical clearance that this client was stable for outpatient therapy and asked that the doctor stay in touch with the patient, monitoring vitals and labs, and provide ongoing information to the team. This client was older than individuals treated with FBT by the manualized method [in which a manual is developed outlining the steps for a given therapy], so she was asked initially whether she would “invite” her family or significant others to help her be able to eat. She said she would and also asked that her longtime boyfriend be involved. This was discussed and cleared with the therapist. With adult clients, I ask or invite them to consider thinking about who can help them by supporting them in their eating. College-aged clients may choose parents or significant others. In this case, the person diagnosed with an eating disorder chose her parents and longtime boyfriend. Our first meeting was with all these individuals, and I explained how important it would be for the family and the boyfriend to offer support, such as shopping for food, preparing food, and being with this client while she ate. I weighed her and sent my reports to the doctor and the therapist weekly, and the therapist and I talked at least once every week to make sure we were on track. This client chose to meet with me separately to work on her distorted ideas about food and how her body responded to food. An initial challenge was that this client wanted to change her behavior but was fairly well entrenched in eating disordered thoughts and behaviors. She overexercised and did not want to give this up, and a big challenge came from the fact that her parents were also physically active, believed exercise to be healthy, and saw her exercise as being “all she had” and so argued for her exercise to continue. Both the doctor and I talked to the parents about the dangers of exercise at this stage of illness, and eventually the parents supported the team recommendation for their daughter to suspend exercise until weight restored. Another challenge was that the parents early on insisted they could “trust” their daughter and did not have to monitor every meal and snack, but the daughter was throwing away food when the parents left the room. Weight gains were slower than expected, and eventually this was discovered and the parents were encouraged to watch all of each meal and snack be eaten. The parents were regularly coached in how to support eating, what not to say, and, when they asked for it, were given nutrition information to support increases in calories. Otherwise, they were encouraged to trust their knowledge of how to feed their daughter. This client was weight restored within six months. During the first two months, she had every meal and snack monitored mainly by her parents and then later her boyfriend, who was very good at learning about eating disorders and being supportive without being authoritarian. It is important to make sure those who are in supportive positions do so in a developmentally appropriate manner. I try to have clients describe what they think they need the most help with, what is triggering for them, what sounds helpful, and what does not sound helpful as far as advice. After weight restoration, this patient learned to eat in an intuitive manner and felt confident to carry this forward after another two months. Lesson learned: Technology such as e-mail and text support can help keep clients on track. Case study: I am a huge fan of using e-mail and text support to help clients stay on track. It is often a big undertaking to be available by e-mail, phone, or text, but I feel like many times this additional level of support has helped my clients become more successful. My client, K. E., lives at home with her mom and her brother in an unsupportive environment. K. E. struggles with both anorexia and binge eating disorder, and she has previously been in an inpatient treatment center. She has struggles with feeling she doesn’t deserve to eat during the day and then oftentimes overcompensates at night by eating large quantities of food and then feeling remorse, which causes her to severely restrict the next day. As we often witness, these situations tend to repeat themselves in cycles that increase during periods of stress. At first I just watched and listened to her describe these cycles, and my recommendations to change these destructive patterns did little to actually stop them. The time between her appointments with me simply included too many binges. Her shame increased with each passing week, as did her desire to give up. I decided to have her e-mail me as frequently as she wanted to provide extra support between appointments. She was not used to asking for help, so at first she did not e-mail me often, but I encouraged her to e-mail me every day simply to touch base. We were in new territory, so I did not know exactly how I could help, but I knew that what we were doing—appointments twice per month with me and weekly appointments with her therapist—was not enough. We tried many different techniques to get her to e-mail me regularly, and we came up with some guidelines that work well. K. E. e-mails me daily with her food diary; ideally, she also e-mails me with the next day’s food plan. This encourages her to plan her meals and stay accountable for what she does eat. We have been e-mailing for months, and this has really helped K. E. stay on track. As her advocate, I help her learn to provide exquisite self-care one step at a time. I encourage her daily to do something positive for herself, encouraging her to get adequate sleep, knit, draw, reach out to a friend, go to church, walk her dogs, and do other forms of stress reduction that are geared directly to her situation. I am also her safety net. I am there to help her break the binge cycle. She texts or e-mails me when she is thinking about bingeing. Oftentimes, simply reaching out to me (whether I am technically there or not) has helped to stop a binge once it has started or, more often than not, to prevent a binge. K. E. is developing a healthier relationship with food and is learning to reach out to people instead of food when she is stressed. It also reinforces the positive habit of planning for success. Such technological support is usually short-term while my clients are going through a particularly stressful period of time. With my work over the years, I have often seen that during periods of stress, most of my clients either relapse or discontinue nutrition counseling, when in fact these are usually the times that the client needs additional support. Additional support with the help of technology has helped my clients through rough spots time and time again. I have other clients who e-mail me photos of their food or questions they are having about their eating, but we mostly focus on prevention—what they can do to best handle the upcoming eating situation. Many times these new situations come up in between appointments, and having the ability to contact me via e-mail or text has helped my clients become more successful. It is also very inspirational for me to have my clients e-mail me their success stories and insights between appointments. This has been a valuable addition to my repertoire of services. Case study: Because most communication is nonverbal, silence often precedes something very important that the patient is not ready to say. I had known this patient since she was 12 years old; she was 18 at the time of this event. She was in and out of treatment centers and my care for the treatment of anorexia. She also struggled with substance abuse, self-harm, and depression. This patient came to see me for a follow-up visit. The mother dropped her off and went to run an errand. The patient did not speak. This was someone I had known for six years, who I had a good relationship with, who usually talked freely with me. I commented that she wasn’t speaking; she didn’t respond. She didn’t say anything and didn’t respond to questions. She got up to leave the office, even though she couldn’t leave because her mom had driven her to the appointment and was no longer on the premises. I followed her—out of the office, the waiting room, the building, and to the smoking area, where she lit a cigarette. I sat down next to her. As she smoked, I made a couple more comments here and there about the weather, the leaves falling, etc. She did not respond to any of this. During the course of this session, I did not feel calm. I felt alternating irritation, confusion, anger, fear, and inadequacy. Even though I understand the value of this silence now, at the time it was very upsetting. When her mother came to pick her up, I said it seemed that today was not a good day for nutrition counseling, as she didn’t feel like talking, so perhaps let’s not schedule another appointment until she is feeling more like participating. I said this in front of the patient, not judgmentally, just factually. As soon as they left, I felt something like panic. How could I charge the family for a session in which I did absolutely nothing? No intervention. Nothing. It felt very strange. I put in a call to the patient’s psychiatrist, asking for a call back. When he called me back the next day, I reported what happened during the visit and that I felt strangely and asked if he could offer me any support. He responded that after her silent visit with me, the patient had made a decision to check herself into rehab. Obviously that had nothing to do with me, I said, as we didn’t even talk about rehab. He said he didn’t know that that was true—that offering a patient a safe place to be herself, to have her thoughts, to sit with her and honor her choice to not interact without judgment or irritation or punishment in itself is a service. (The therapist said) certainly I should be paid and most certainly that session was an intervention. It was the strangest feeling to hear this and a perfect reminder that only a small portion of communication is verbal, that we can support a patient without necessarily providing information, and that before, during, and after you have delivered information, the most important thing you can do is to listen. Even if the patient is not talking, it is still your responsibility to be there. This is an extreme example, but in many cases a patient is silent longer than I would feel comfortable with if this were a social conversation. When in conversation with a friend, such a silence would be my cue to speak; in a patient care session, I hold my tongue and say nothing. The pause lasts longer than I may be comfortable with, but I wait. I have had to learn to tolerate the pauses because they often come before something significant. Lesson learned: The dietitian and treatment team can do only so much. Case study: A lesson I learned the hard way is that no matter how hard you (the dietitian) work at coaching, educating, and supporting your client with an eating disorder, sometimes the client just will not budge. It seems the older the client and the longer the eating disorder has been ingrained in him or her, the more difficult it is for the client to choose recovery over the eating disorder. I tell my clients and their loved ones that the eating disorder did not happen overnight and, for this reason, recovery takes time, patience, and persistence. Relapse is usually evident and truly stinks, but as an optimist, I encourage my clients to reflect on their response to the relapse incident in hopes that they learn from it and grow stronger in their recovery. I worked with this client for about a year alongside our treatment team. This client was diagnosed with anorexia from the age of about 18 and continues to struggle to this day. The client is now in her mid-50s. This client also has personality disorder, which makes her treatment more challenging. She grew up never feeling good enough, even though she was the homecoming queen and a straight-A student. I sense that she found it hard to continue to live up to this potential and pressure she put on herself. She also has abandonment issues, first with her father leaving the family when this client was very young and then when she was abandoned in her early 20s by her boyfriend, who left her for someone else. She was also an alcoholic shortly after her anorexia diagnosis. Alcohol can also be used as a coping mechanism for someone when he or she feels lost. Subsequently, this client has been in and out of treatment centers with no sign of recovery. This client is incredibly anxious and literally would go blank and shut down when it came to mealtimes. It was amazing to see how disconnected her mind and body were. Many times when I would meet with her for a nutrition therapy session, it was as though I was speaking to a wall. She has definitely been one of my most challenging cases, if not the most challenging one, basically due to speaking very little during many of our sessions. When she did speak, the only words that would come out of her mouth were “My body is not working” and “I want to die.” This case is such a sad, unfortunate one. This lady has no passion, hobbies, likes, dislikes; she is completely numb and lost in her eating disorder. This client was eventually moved into a group home for the mentally ill because her sister, who is her legal guardian, cannot physically take care of her. I am not sure how she is doing today, but I would like to visit her. It pains me to see someone who was once so full of life now living in the complete darkness of a vicious eating disorder. This was the first time I was not able to help someone. This client taught me that the dietitian and the treatment team can do only so much. Ultimately, the client needs to pull his or her part, too, even just a millimeter. This client was just not willing to choose recovery. She continues to live in denial of having an eating disorder and as a result of 30-plus years of suffering, her cognitive function has been greatly affected. Lesson learned: What you get the patient to tell you is worth much more than what you tell the patient. Case study: Eating disorder patients are recovery challenged because of a level of resistance. They also often share a language of their own and can be reached effectively through the use of cognitive behavior therapy and word pictures or symbolism. One patient sought help for her binge eating disorder and obesity by saying, “I am here to get help, but I am afraid you will take away my best friend!” Knowing this patient had just provided me a wonderful opportunity, I questioned her further about her statement. She reported that her “best friend” was her cookies and ice cream in the evening. Because I knew that binge eating disorder causes a painful relationship with food, I asked her to tell me what happens before and during her encounter with her so-called best friend. She told me about the anticipation and excitement of planning her eating. She told about taking the phone off the hook, the taste of these foods, and the feeling of comfort while she was consuming them. She told about the feeling of growing fullness and the urge to keep eating. As I always tell students, what you get the patient to tell you is worth 100 times what you tell the patient. This patient’s statement about “dumping” her current relationship with food gave me the perfect springboard to launch past her resistance and into discussion about behavior change. This patient was able to reduce the frequency of the binges and then reduce the amount eaten at each binge and lost weight while developing healthier coping skills like artwork and moderate exercise. The road to eating disorder recovery is hardly, if ever, straight and simple, and textbooks of counseling techniques can teach only so much. For dietitians involved in these patients’ recovery, time in the trenches with trying clientele has offered its own insights that other RDs might do well to bear in mind. First, says Barth, for any RD working with clients with eating disorders, strong counseling skills are a must. “Working with eating disorders is a science and art. Motivational interviewing skills are a necessity, and having a deep understanding of eating disorders and the eating disorder language are key. Without these understandings, one can do more damage than good when working with this fragile population,” she says. Smith-Oswald agrees: “Every failed encounter an eating disorder patient has with a nutritionist because of inability to deal effectively with a patient’s resistance by using overcontrol or passivity may create a higher level of resistance and fear of failure in the patient, impeding progress later. And because food/nutrition is just one aspect of any eating disorder, Barth and other experts agree that a team’s expertise can be more effective than working solo. “I highly recommend working with a treatment team consisting of a medical doctor, therapist, and psychiatrist in addition to the RD,” says Barth. Setnick says regular communication with other professionals working with eating disorders can also aid RDs who may have hit a wall with a particularly tough client. “Talking with other professionals who work in the field is so helpful because it shows that we are all experiencing the same things,” she says. In general, Waterhous cautions RDs working with eating disordered patients against being too quantitative. “Discussion of calories and fat grams is very disturbing to people at an early stage of recovery and really may not ever be necessary,” she says. “This depends on the person and what they need as they recover from an eating disorder. Many with anorexia nervosa have features of OCD [obsessive-compulsive disorder], and so excessive quantitative information leads to more obsessing. Plus, they often already know about the calories in foods. Another critical point for RDs to note: No client will present with the same circumstances or the same exact disease; therefore, interventions will vary. All RDs interviewed noted the copious challenges that clients with eating disorders can bring to the table, and according to Barth, counseling this clientele requires a certain level of resilience. Yet without a doubt, each dietitian also noted that the meaning and satisfaction gleaned from these encounters were well worth the energy expended.